Protect process equipment with one of the world’s leading softener systems. The Culligan Matrix Solutions line of softeners is one the most complete in the industry, satisfying demands for scale reduction for flow rates from 1 to thousands* of gallons per minute. With reliable Progressive Flow,Culligan Smart Controller, Brine Reclaim and Aqua-Sensor® technologies, the Culligan Softener systems are among the most efficient on the market. For complete customization, softeners are available in corrosion-resistant tanks made from carbon steel or fiberglass. With the Culligan Smart Controller, the Hi-Flo 3e also features a smart design with a top-mounted control valve to reduce the length of pipe needed for installation. 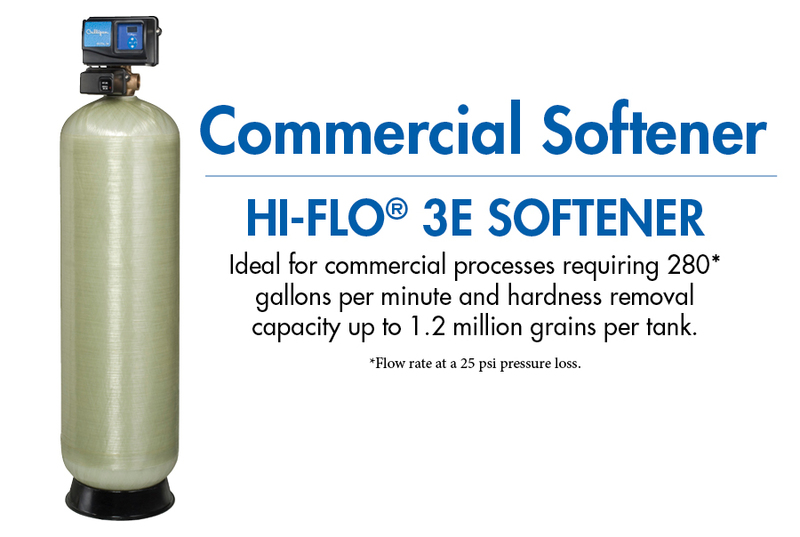 The Hi-Flo 3e is ideal for light industrial processes requiring 280** gallons per minute and hardness removal capacity up to 1.2 million grains per tank.